Bayonetta is an action adventure game in the vein of Ninja Gaiden, and Devil May Cry. It got almost universally good reviews, being praised for its fantastic main character, and fluid game play. You play as Bayonetta; a Witch who awoke 20 years in the past with no memories. She heads to the Town of Vigrid where two different supernatural clans used to be based. 500 years ago there was a Sun worshipping clan called the Lumen Sages, and a Moon worshipping clan named the Umbra Witches. 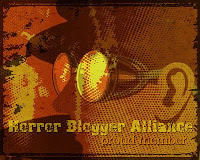 They worked to shape history until a war wiped them out. Bayonetta hopes that the answers to her past will be found in this Town. The plot is really weird and kooky in places, and I must admit I did get a bit confused by the whole thing. Basically in each level of the game Bayonetta is under constant attack by Heavenly beings. Their announcement is always met with religious music playing, and they embody the foundations of Christianity. In the game there are 3 different planes of existence layered on top of each other. There is Paradiso where the Angels live which is a place of utter beauty, there is the normal Human world, and then there is Inferno where Demons come from. People in the Human world cannot see Angels or Demons, instead they just feel their presence. Most the game takes place in Purgatory, a place where you can fight Angels away from Human eyes. 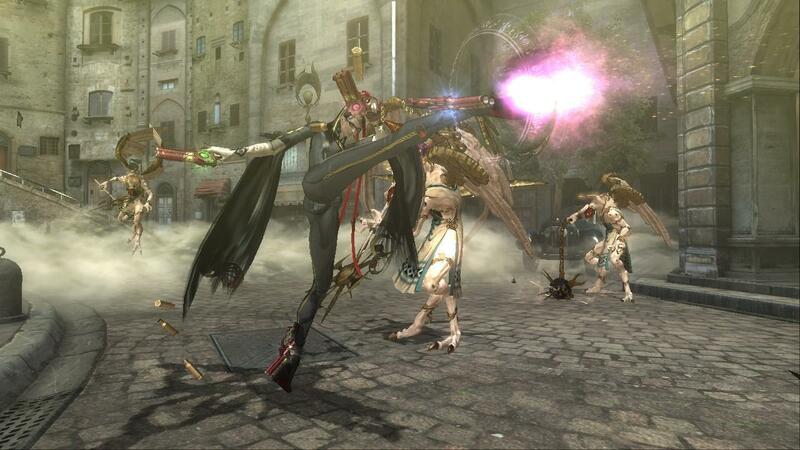 Bayonetta is a naked long legged Witch. She has a catsuit magically made from her own hair which covers her. Her attacks incorporate hair, and so the more powerful the attack, the less she is wearing. There is a heck of a lot of moves she can do. She has two pistols strapped to her hands, and two pistols strapped to her ankles. She can summon giant high heeled shoes, and fists to attack enemies. She can turn into a panther, a crow, and bats to help in her fighting, and for her finishing move she can summon ancient torture devices such as an iron maiden to finish enemies off. Boss battles always end with Bayonetta summoning a gigantic Demon from Inferno. There are a multitude of different weapons you can get access to, as well as a shotgun you also get access to a sword, whip, demonic claws, and even a pair of ice skates! By careful use of the dodge button you can initiate 'Witch Time' that slows everything down allowing for extra punishment. Enemies are unique in that they are all Angels, the Demons being on your side. 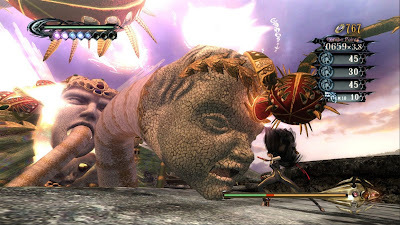 There are lots and lots of different enemy types, most incorporate cherub faces, whether your fighting flying cherubs, or gigantic monsters they are adorned in religious imagery, and are mostly white. Killing enemies leads to the appearance of Halos which are the games currency. By visiting 'The Gates of Hell' (a bar) you are able to upgrade your weapons, buy new moves, buy items to help cure you, regain magic etc, as well as other knick knacks that improve your stats. The game is really crazy and fun. There are many references to other Sega games with two levels even having direct homages to them. For example one level in which you are riding a rocket opens with Bayonetta saying 'Welcome to my Fantasy Zone' before the Space Harrier music starts and the game pretty much turns into Space Harrier for the duration. The story is confusing but frequently funny. 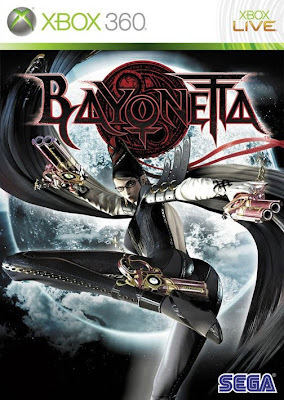 Main characters include a spy reporter called Luca who believes Bayonetta murdered his Father, a young girl who bears a striking resemblance to Bayonetta and refers to her as Mother as well as a mysterious witch in red who turns up to battle at various times. The bosses in the game are for the most part completely gigantic and dramatic. They are the Cardinals of Virtue, the big wigs in the Heavenly command. They include a giant upside down flying head with two snakes protruding out of it, a gigantic holy woman, and a head that is defeated by you ice skating up its tongue before lopping its head off revealing its squirming purple brains. There is a hell of a lot more I could say about this game. It is really really fun, and much better than the elitist hardism of Devil May Cry. Lots of unlockables mean lots of replay value. While the story isn't exactly coherent it is at least skipable if you so wish. If your looking for a outlandish game with the attitude of Killer 7 and with added empowerment then this is the game for you. A beautiful love letter from Sega.